Stop #3 of the 2017 PEI Burger Love tour. This was my first visit to Broadway 45 in Kensington. It's been open for less than a year but has already established a reputation as a great spot to eat. Very open concept with 20+ ft ceilings and an additional loft area with extra room for dining plus lounge chairs and couches if you wanted to enjoy a drink in front of the fireplace. We were seated in the loft area and it was a great spot to enjoy our meal. Craft beer fans will also enjoy the variety of different brews on tap from several of PEI's microbreweries. I went with one of my favourites, Blueberry Ale from PEI Brewing Company. Friends with us went with the selection from Moth Lane Brewery. Now to the burger, the "Meat Me on Broadway" consists of 4 oz Island Beef Patty, 2 oz Beef Tenderloin Medallion, 2 oz Braised Beef in Green Peppercorn Demi Glaze, Herb & Garlic Gouda, Green Tomato Salsa Spread, Bacon, Tomato, shredded Iceberg Lettuce, Grilled Onions, Grainy Dijon Mayo on a toasted Potato Scallion Bun topped with Pepperoncini Pepper. A lot of ingredients but still easy to eat like a regular burger. Let me say that when you put 4 different kinds of meat on a burger you're starting off in the right column with me. The beef tenderloin medallion was tender and very tasty. Unfortunately, I'm not a fan of dijon or peppercorn and you could taste those flavours in every bite. As far as price, it was $16 for the burger which is a bit on the high side. You have the option of adding a potato side for $3 or risotto for $6. Overall a pretty good burger but didn't have that "wow" factor. Had the sauce been something sweet like a BBQ or rib flavour I would have rated higher. 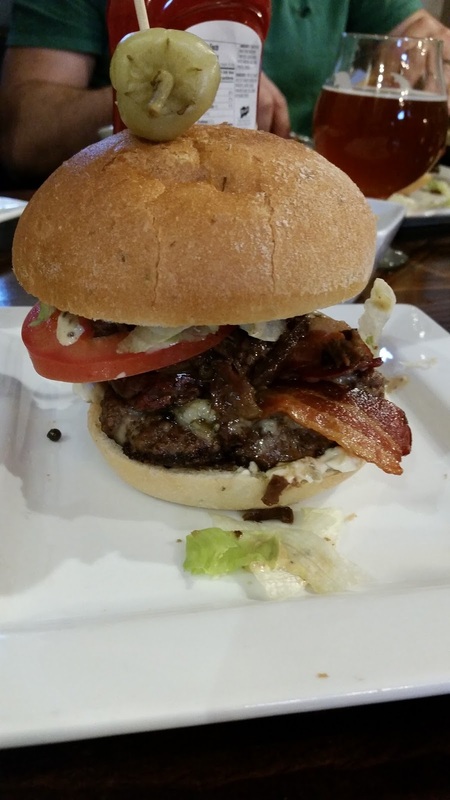 If you want an enjoyable dining experience in a great atmosphere check out Broadway 45 and if you like dijon and peppercorn, this burger will be one you will want to try.